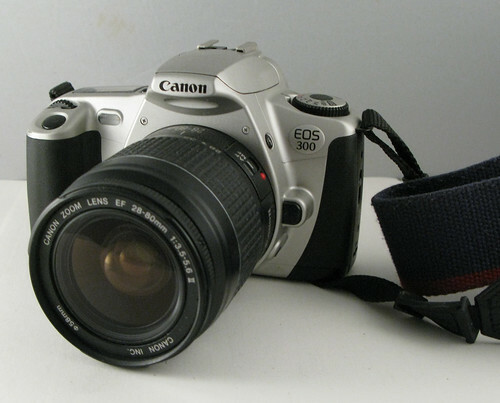 The Canon EOS 300 was introduced in 1999. The branding EOS Rebel 2000 was used in the North American market. Date versions are also available. 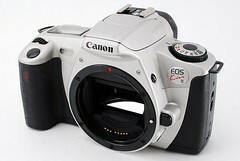 The camera was known as the EOS Kiss III in Japan. Similar to the previous Japanese distributed EOS cameras, they typically have the QD / Date feature standard, often with a panorama masked feature as well. This particular model also has a built in remote control sensor that is not present in American and worldwide models. 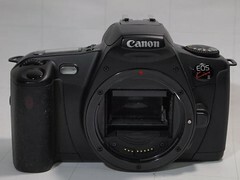 A slightly improved version was released in 2001 for the Japanese market called EOS Kiss III L, but it is also often called EOS Kiss 3 L, to avoid confusion between characters I and L. The differences is that the LCD is backlit, also includes the RC-5 remote control. 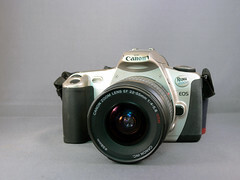 This model is the entry level of the consumer lineup and has a safety feature that shoots the film backwards; it goes into the canister instead of out, thus reducing inadvertent exposures ruining the entire roll if the back is ajar. It is not compatible with IR film, as it uses IR light to track frame spacing. CR2 batteries are used for power while most of the mid-range EOS cameras uses 2CR5. For other battery options this camera supports battery grip pack BP200, easing portrait orientation with an additional shutter as well as allowing it to use of more common 4X AA batteries. Focus: autofocus, 7 points w/ AF assist and manual option. Exposure modes: Program AE, shutter priority, aperture priority, depth-of-field AE, and full auto. Shutter Speeds: 1/2000 to 30s with bulb. Film transport: Auto with prewind, Auto end of roll rewind, mid roll rewind. Flash: Built-in, GN 12, TTL, 3 zone. 1/90 sec. sync. Power: Two CR2 lithium batteries with four segment power level, CR2025 for date back. Weight: 355 g. (11.8 oz.) body only. This page was last edited on 8 February 2017, at 06:36.